When Leesburg Mayor Kristen Umstattd pounded the gavel last Tuesday, it marked more than just the end of a Town Council meeting. It marked the end of a 22-year council career. Umstattd is expected to formally resign her mayoral seat by month’s end in anticipation of the beginning of her four-year term as Leesburg District supervisor Jan. 1, 2016. Umstattd was elected Leesburg’s mayor in 2002, but her tenure on the Town Council began 10 years earlier. She goes into the history books as Leesburg’s third longest-serving mayor. For Umstattd, her civic-minded nature came about at a young age. She recalled during a recent interview how her parents involved her in their political activities. Umstattd moved to Northern Virginia in 1981 while still serving with the U.S Navy and then began working for the CIA four years later. In 1987, she moved to Leesburg and has called the town home ever since. Her first political race would come four years later when she ran unsuccessfully for the State Senate seat long held by Charles L. Waddell, a Democrat. While initially running as a Republican, Umstattd left the party to run as an independent. She is now a member of the Democratic Party. “They were very concerned that citizens were being kept out of the loop and didn’t know what was going on. They asked me if I would run,” she recalled. The two women, Anne Darling and Patricia Friedman, have since moved out of town. 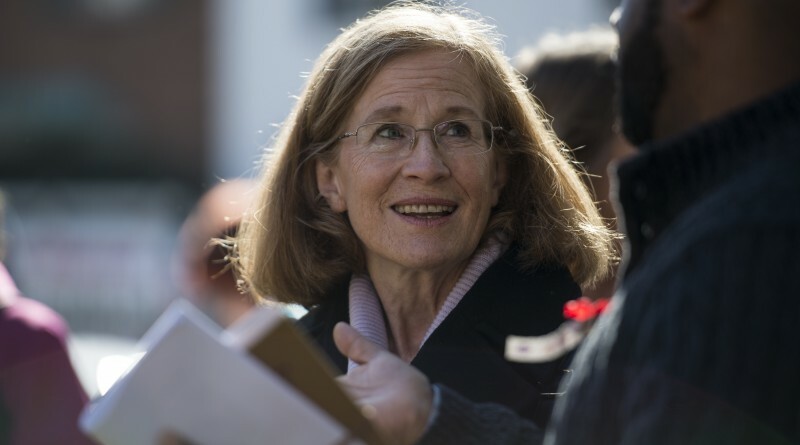 But the mayor said the environmentalists shared her concerns about air quality and protection of streams, and Umstattd decided to give the council race a shot. Throughout the 20-plus years she has served, Umstattd built a reputation as a compassionate and caring mayor and council member. At ribbon-cuttings—and she is there for most of them—she makes an effort to learn the names of the business owners and their families, and any concerns they may have. During the difficult times, Umstattd has walked through neighborhoods that have been impacted by a serious crime, circulating letters or offering personal comfort that the town staff is there for them to address any concerns. And as but another example, her personal Facebook page—Kristen Umstattd, Mayor–offers not her policy positions on various matters, but instead a pictorial representation of different things, people and places throughout the town. But that is certainly not to say that Umstattd has not butted heads with others when it came to her strong opinions even when in the minority. The mayor over the years voiced her support for the hefty percent surcharge levied on Leesburg’s out-of-town utility customers and strong opposition to development applications that would bring added residential density to the town. One particular instance that drew the ire of Leesburg’s out-of-town utility customers–as well as some town residents and Town Council members–was a letter Umstattd circulated in the throes of Town Council debate over how to set water and sewer rates. This followed the town’s defeat in the Circuit Court over the legality of the town’s 50 percent surcharge and a mandate by the court to set new utility rates. Umstattd’s letter criticized lowering utility rates for the customers living outside of town limits with their “estate-sized lawns” and instead passing on added costs to the middle-class town residents. While the letter drew harsh rebukes from many, Umstattd was, and has remained, unapologetic on that and other political viewpoints which may have lost her some supporters along the way. “I’ve lost more votes than I’ve won. I’ve gotten used to that; I don’t dwell on it very long,” she said. “They may oppose you in one situation but continue to treat them well; they may be your friend again someday down the line,” she said. One particular anecdote Umstattd recalled was during a neighborhood sidewalk widening project. The mayor opposed the project because it would involve cutting down mature trees while a resident of the street badly wanted the construction to go forward so his wife could enjoy a wider sidewalk. Respecting voters has been of critical importance to Umstattd and likewise will be for the next town mayor, she said. “I do believe you need to let the public tell you what they need. It’s easy to fall into the trap of ‘they elected me so I know what to do.’ You need to be very mindful of the differences of opinion in the community,” she said. An ability to work well with others and to offer differing opinions will be important to Umstattd during her service on the Board of Supervisors. She will once again find herself in the minority, as one of only three Democrats, not to mention one of three women, on the board. The timing for Umstattd’s run for a supervisor seat was right for many reasons. Her daughter, Kendrick, now a freshman at Yale University, was her No. 1 priority even during all her years as mayor. Umstattd said that, as a rule, she did not take any phone calls after her daughter got home from school each day so she could help her with her studies. Seeing firsthand as an involved parent what teachers, school staff members and students dealt with on a daily basis was a big reason Umstattd wanted to help effect change in that area. The Leesburg Town Council does not have any control over Loudoun County Public Schools. While it is not yet known who will fill the mayor’s seat–Vice Mayor Kelly Burk will serve as acting mayor until a new mayor is appointed–Umstattd hopes that her successor will have the time to devote to the position as she did. “You are in charge of making sure that 50,000 people are OK. It’s gotten to be a pretty demanding job,” she said, pointing to the endless stream of invitations to attend ribbon-cuttings, community events and school functions. Looking back at her council and mayoral tenure, she sees many highlights. Umstattd points to the recent Crescent Parke groundbreaking where she got to “sit on the big [construction] claw,” the time she tapped a keg at Vintage 50 to celebrate the town’s 250th anniversary, and another occasion where she got to savor a bottle of champagne. She also thoroughly enjoyed the times she got to visit students in the schools, recently teaching some civics classes at Tuscarora High School and reading to kindergartners on other occasions. She points to many successes over the years. One of the things she said she is most proud of is the town’s ability to catch up with and complete the upgrades to the town storm sewer system, as well as the conclusion of many key transportation projects. But one area that has continued to bedevil Leesburg throughout all her years on the council has been the downtown, she said. As to why she continued to serve for so many years, and as she looks to at least another four years in the service of the people of Leesburg, Umstattd has a fairly simple explanation. And grateful she has been. When asked if she could offer any “last words” to town residents as her days as mayor are shortly numbered, Umstattd is concise.